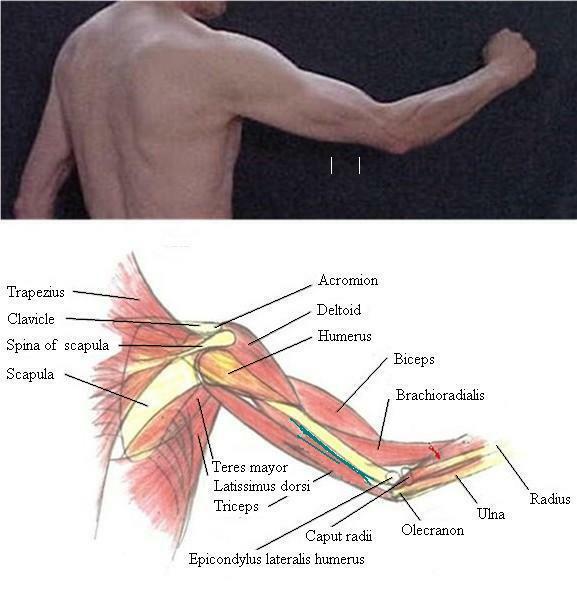 The upper margin of the arm is formed by deltoid and biceps, the lower margin by the part of the triceps connecting scapula and the olecranon of the ulna. The olecranon is clearly visible as a point of repair. Also visible are two muscle "bulks" of the triceps (above white marks) arising from its aponeurosis and connecting to the humerus. Note: Teres mayor and latissimus dorsi underpass the triceps to reach the humerus. Note: The brachioradialis attaches to the humerus in-between biceps and triceps.